Wait a minute, did you just read that title right? Did it really just say that AT&T is selling the iPhone 3 for only $9? That’s right folks 0 $9 iPhone 3’s for sale – check it out right here. 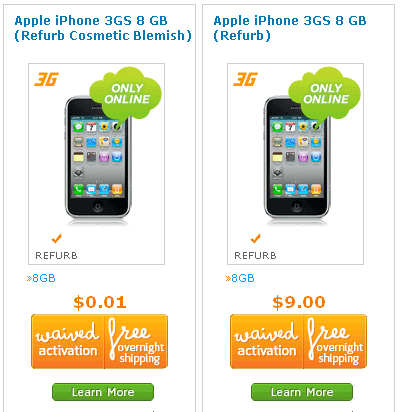 AT&T is slashing the prices of refurbished iPhone 3’s and selling them online for only $9. It gets better than that actually, you can get slightly blemished refurb’d iPhone 3’s for as low as $.01. You can definitely expect the iPhone 4 to soon follow suit. The iPhone 4 is currently selling for only $199 – and a white iPhone 4 to boot. So what’s all this dumping of iPhone inventory all about anyway? Well folks, there’s only one logical reason and that’s to make way for the new Apple iPhone 5. The iPhone 5 is expected to hit the shelves at AT&T and Verizon sometime in September, according to most rumors that are out there. And Apple needs the iPhone 5 to sell, and sell in large scale. So for now, AT&T is dumping their inventory of what’s now considered old iPhone’s to make way for the new. Are you going to be picking up with of these dramatically discounted iPhone 3’s?